Gtechniq Crystal Serum raised the bar for the performance expected from a nanotechnology-based ceramic sealant, providing exceptional levels of resistance to swirls and extremes of pH. Once cured, the coating is so durable it can only be removed by wet sanding followed by machine polishing. 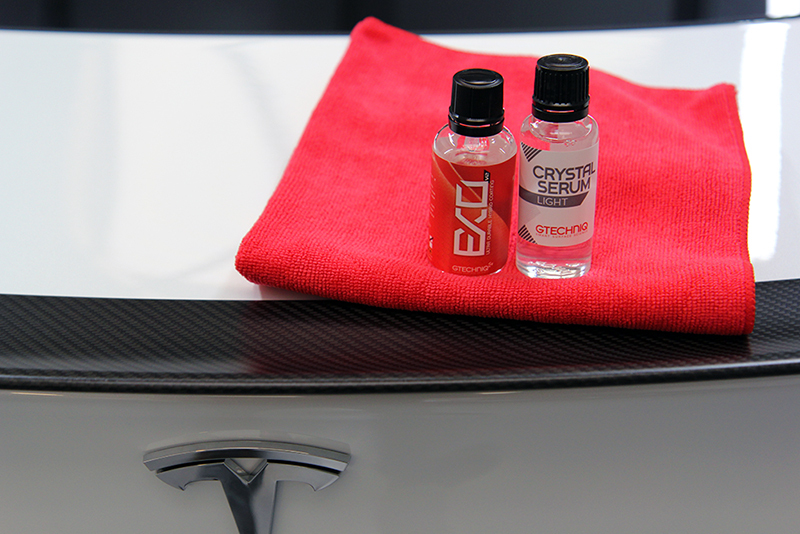 Up until now Crystal Serum has only been available as a service provided by Gtechniq-authorised detailers. As a result, the demand for an enthusiast version has been high, and, Gtechniq has responded with Crystal Serum Light. Designed to be easier to apply, in less rigorously controlled conditions, Crystal Serum Light seems to be the answer car care enthusiasts have been looking for. With Gtechniq claiming Crystal Serum Light will provide up to 80% of the protection of the original Crystal Serum chances are this new sealant is going to prove extremely popular! 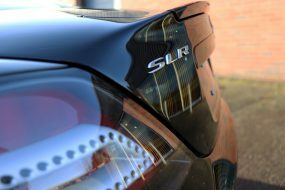 As with any ceramic coating new to UF, Crystal Serum Light was evaluated at UF’s Brands Hatch based Detailing Studio. 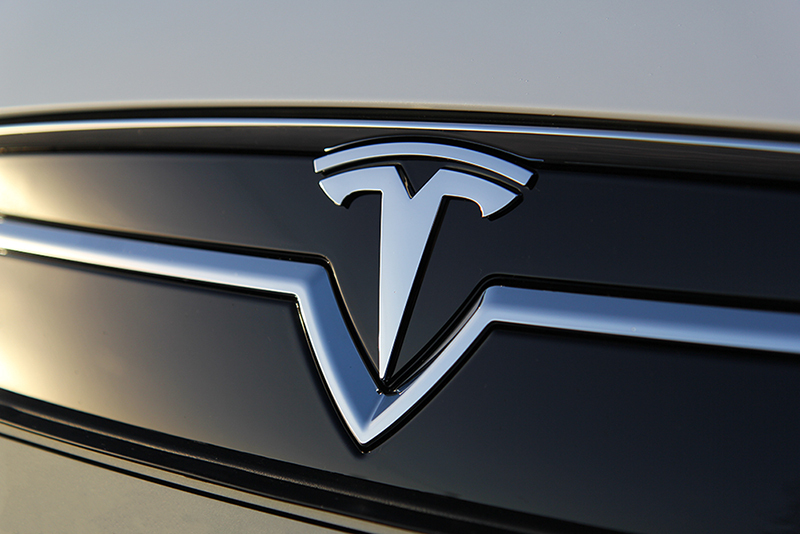 The Tesla P90D is a great example of cutting edge engineering and modern automotive design. 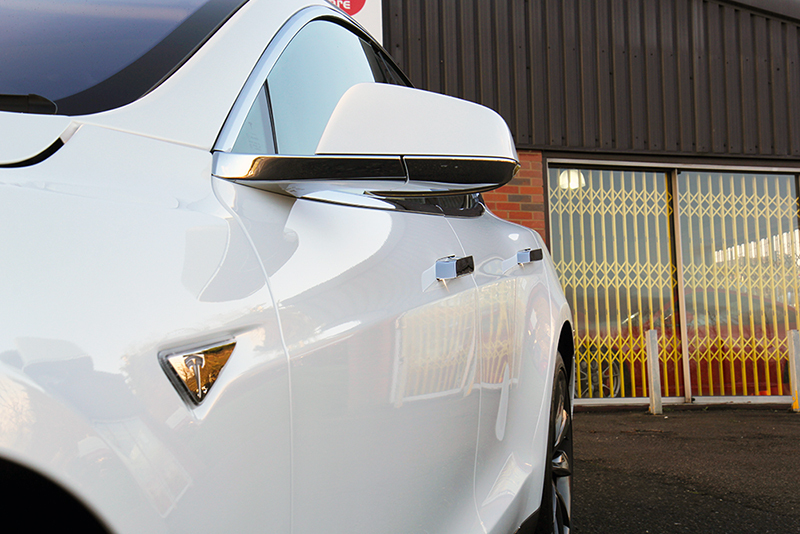 When one was booked into UF Detailing Studio for a New Car Protection Package, the owner was only too happy to have Crystal Serum Light applied to the paintwork. 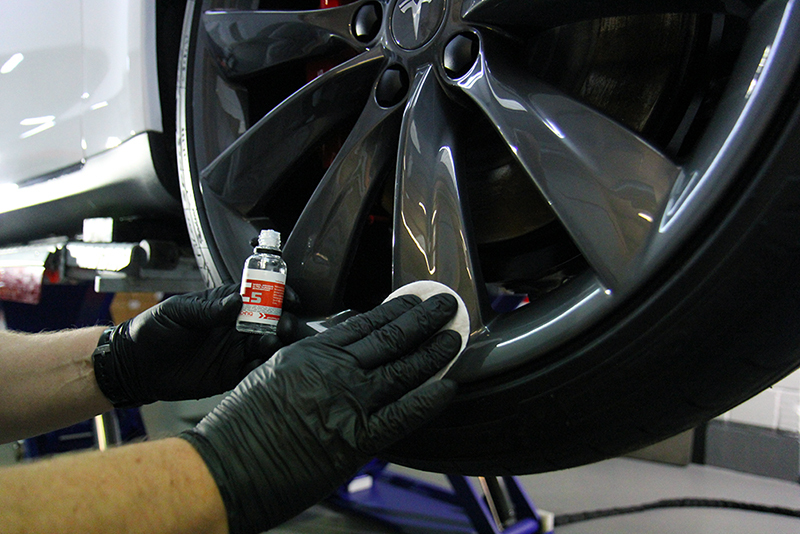 Initially, the Tesla was treated with Gtechniq W6 Iron & General Fallout Remover to eliminate any traces of iron contamination. 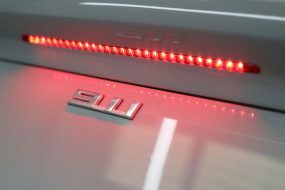 This usually appears as small dark particles on the wheels, sills and around the wheel arches and results from brake pads shredding, either from the cars own brakes or from passing vehicles. Brand new cars are also susceptible as often they are transported by rail and stored in railway sidings during their journey from the manufacturer to the dealership. Metal particles generated by passing trains may end up as contamination on the vehicle. 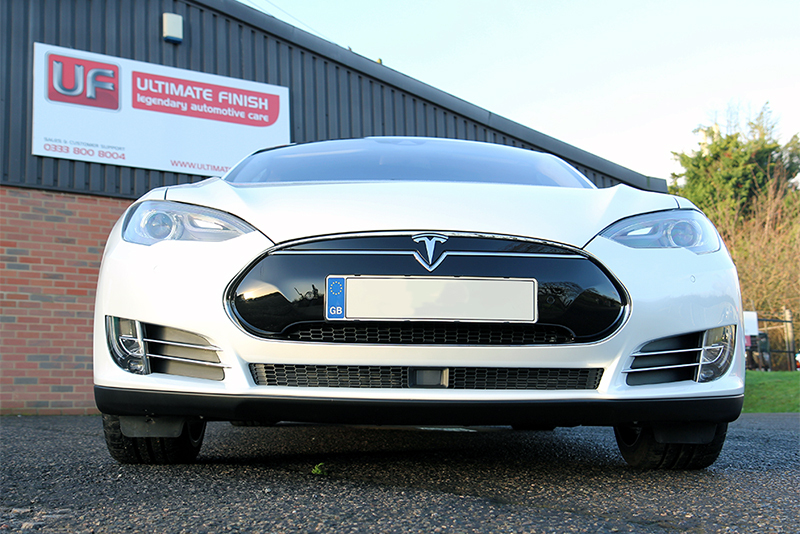 Once W6 residue had been rinsed, the Tesla was then degreased using Bilt-Hamber Surfex HD to remove any road grime or diesel splatters. After rinsing again, the car was then treated with Ultimate Snow Foam, applied through a foam lance attached to a pressure washer. 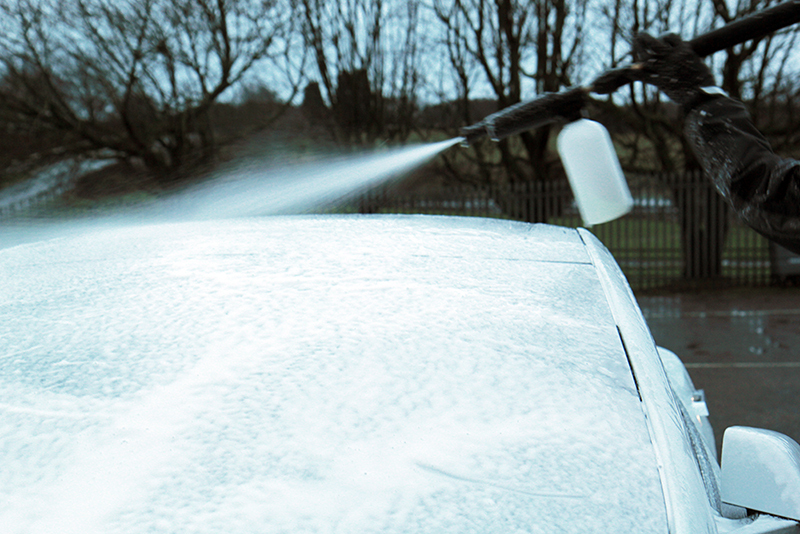 Ultimate Snow Foam produces a thick foam that clings to the surfaces of the vehicle, lifting away larger particles of dirt and grit and allowing them to be freely rinsed away. 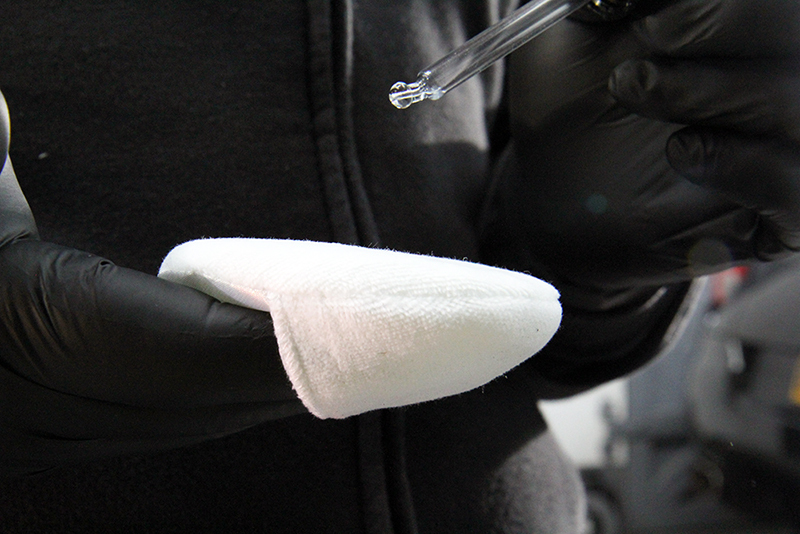 This helps prevent swirl marks being introduced during the main wash by removing the larger fragments of contamination that may become trapped in a wash mitt and then rubbed back and forth over the paintwork. 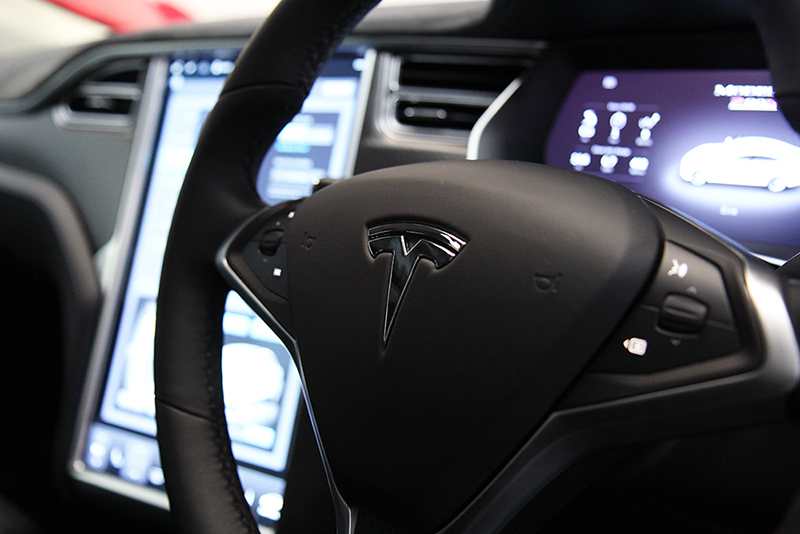 After rinsing the foam away, the Tesla was then washed using the Two Bucket Method, an Ulti-Mitt Double Sided Merino Wash Mitt and Gtechniq G-Wash, a pure shampoo without glossing agents. The car was rinsed again. It was then given a final, pure water rinse using an Aqua Gleam filter attached to a hose before being patted dry using UF Ultra-Soft Microfibre Drying Towels. Once inside the Studio, the paintwork was inspected under high-intensity lighting to check for any blemishes or damage that may require correction prior to the protective coating being applied. After being lightly polished by hand, the bodywork and wheels were wiped over with Gtechniq Panel Wipe, a blend of pure alcohols and aromatic solvents designed to dissolve polish residues. It then ‘flashes’ off to leave a bare surface to which the sealant can fully bond. It was then time to apply Gtechniq Crystal Serum Light. Working a panel at a time, the paintwork was coated with Crystal Serum Light and then buffed. 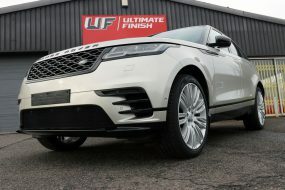 It was then allowed to cure overnight before given a layer of Gtechniq EXO Ultra Durable Hybrid Coating, to add gloss and further enhance the water beading properties. 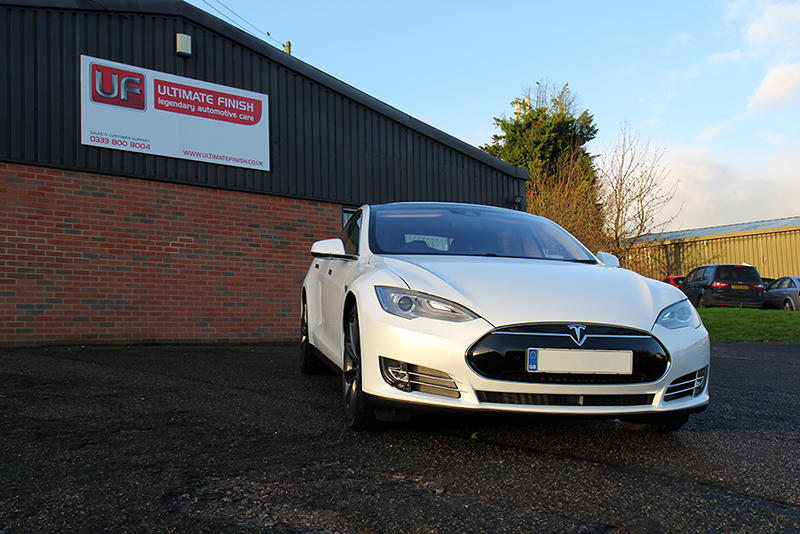 The customer had booked the Tesla in for the full New Car Protection Package, of which protecting the paintwork is just one part. So whilst the ceramic layers were curing, attention turned to the other surfaces. The glass was cleaned and then sealed using Gtechniq G1 ClearVision Smart Glass. 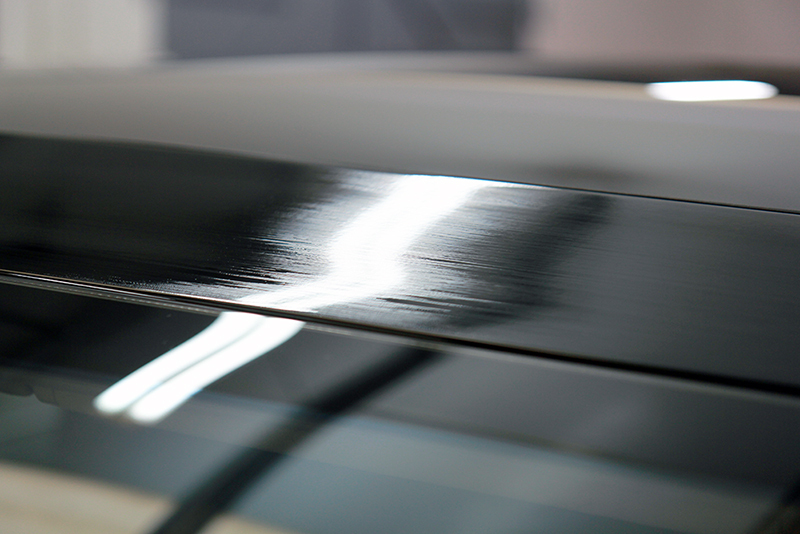 Forming a hydrophobic barrier, G1 causes rainwater to bead on contact, allowing it to be easily blown away even while driving at relatively low speeds. 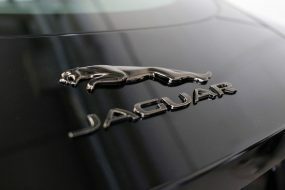 It also inhibits snow and ice from bonding as fiercely to the glass, making early starts much easier. 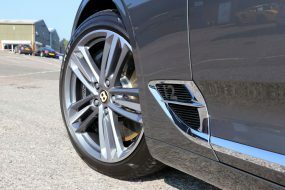 The wheels were coated with C5 Alloy Wheel Armour to repel water, dirt, road grime and inhibit the build-up of brake dust. The coating is also resistant to extremes of pH and high temperatures and so will not burn off when the wheels become hot. A layer of C5 provides around twelve months of protection and because dirt does not adhere as strongly to the treated surface, the weekly wash is much easier. Protecting the interior is also part of the New Car Protection Package. Initially, the interior was vacuumed before the dash and door cards were cleaned and protected using Gtechniq C6 Matte Dash AB, a dust-repelling coating which leaves a non-sticky, satin finish and also provides an on-going antibacterial function. 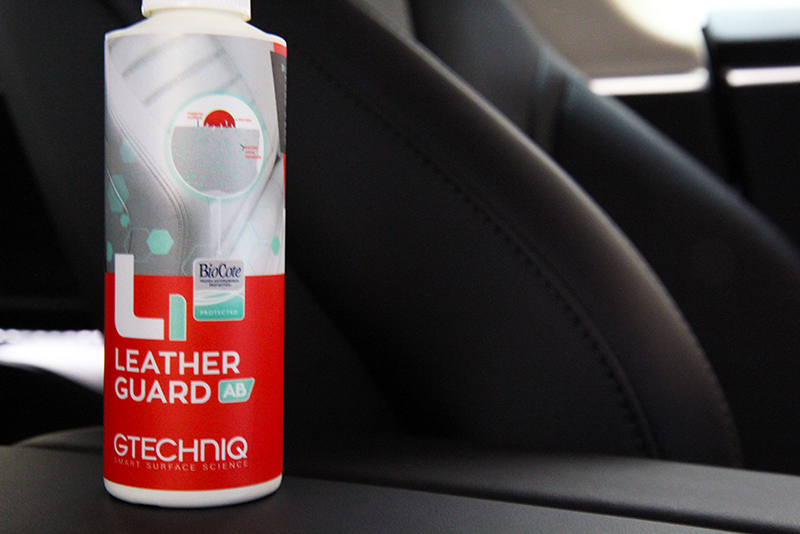 The leather seats were protected using L1 Leather Guard AB. This forms a protective coating without affecting the texture of the leather and helps prevent staining from dye transfer. The protection bonds with the leather surface to provide an abrasion-resistant surface with a natural satin sheen. 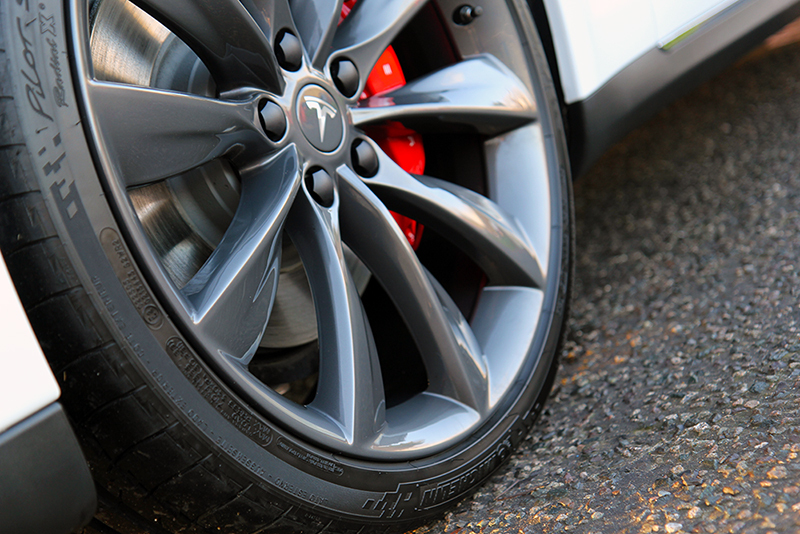 The final touch was an application of Gtechniq T2 Tyre Dressing, to give the tyres a long-lasting, natural look rubber finish. The final result was spectacular. Crystal Serum Light worked really well. It’s easy to apply, easy to buff and leaves a stunning gloss finish. I think our customers are going to love the results, whether they choose to apply it or whether they bring it into the studio. The reflective shine speaks for itself. 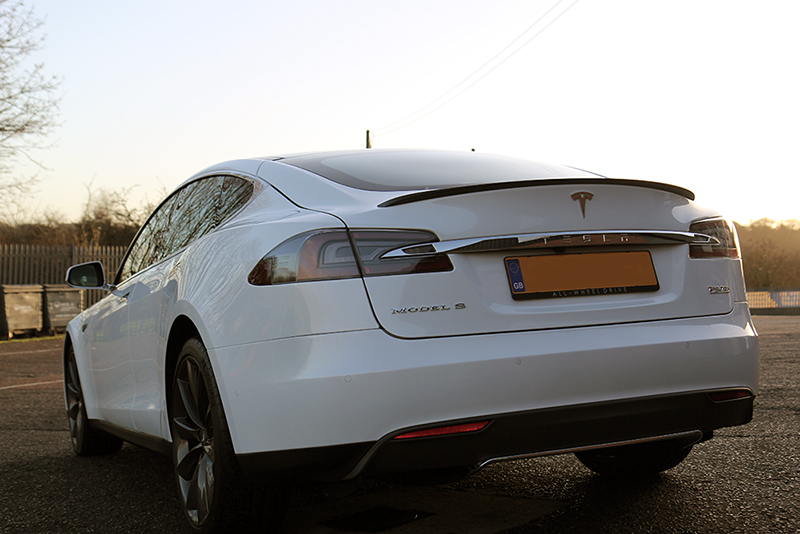 White can be difficult to enhance the gloss on but you can safely say this Tesla now has a truly crystal shine! – Derek Ginger, UF Detailing Studio. Gtechniq Crystal Serum Light and Gtechniq Crystal Serum Light + EXO Kit will be available to purchase from UF from 8 a.m. Sunday 24th January 2016.